This bottle of the Cave Privée Rosé 1979 takes us back 34 years, to the 1970s, a decade that did not produce many vintage years capable of long ageing. The 1979 is an exception which confirms this rule with a rather late harvest and grapes that took time to ripen. The colour today is warm and deep (the blend contains 19% red Bouzy wines) with copper glints. The nose is heady with notes of saffron, curry, leather, dark fruit and a hint of eau de vie. What a youthful palate: we are struck by its freshness underlining the saline character of our chalky terroir. The rich finish has a texture that admits us to the world of great Pinot Noirs. The bubbles are discrete: for this great wine effervescence is only secondary. 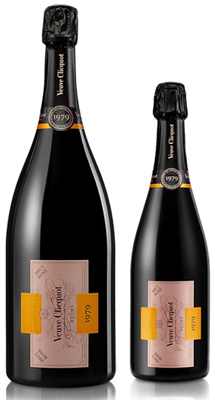 Cave Privée is a range of limited release Champagnes taken from Veuve Clicquot's finest vintages, bottled as they reach their peak of perfection. After seventeen years on lees and two under cork, Cave Privée is treated to a bespoke dosage before being released. Individually marked and dated and available in very limited quantities only. 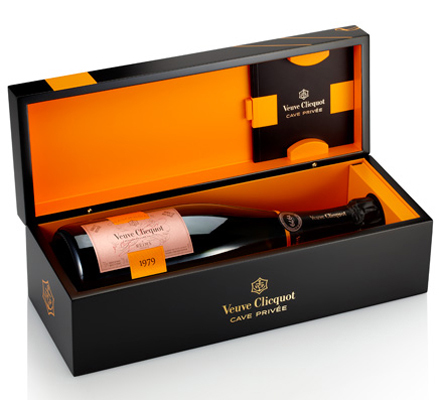 The Cave Privée label has been designed to recall the original Veuve Clicquot vintage label dating from 1893 - each bottle comes in a wooden box with a yellow ribbon woven through it. The bottles are also individually numbered on the neck collar, and the back label carries disgorgement details including the date, the total number of bottles disgorged and the g/l of residual sugar in the dosage liquor. Write an online review and share your thoughts. © ChampagneDirect.co.uk 2018. All Rights Reserved.